Filed to: Bees?Filed to: Bees? Over the course of evolution, flowers and pollinating insects have developed an intimate, mutually beneficial relationship. To get the attention of pollinators, flowers have developed an assortment of cues, such as colorful petals and aromatic smells. But as a new study points out, many plants also express complex floral heat patterns, which bees are able to detect. Plants perform this trick by redistributing the energy of captured sunlight, a process known as plant thermogenesis. Scientists have known about this ability for quite some time, but a new study led by Heather Whitney from the University of Bristol is the first to study the phenomenon in detail and determine if bees are truly interested in these invisible heat patterns. The new study, published in eLife, shows this is fairly widespread phenomenon among plants, and that bees are most definitely attracted to the heat. But the study also serves as a warning, suggesting that climate change could disrupt this sensitive process. For the study, Whitney’s team examined numerous flowers, including common poppies, rock roses, and daisies. 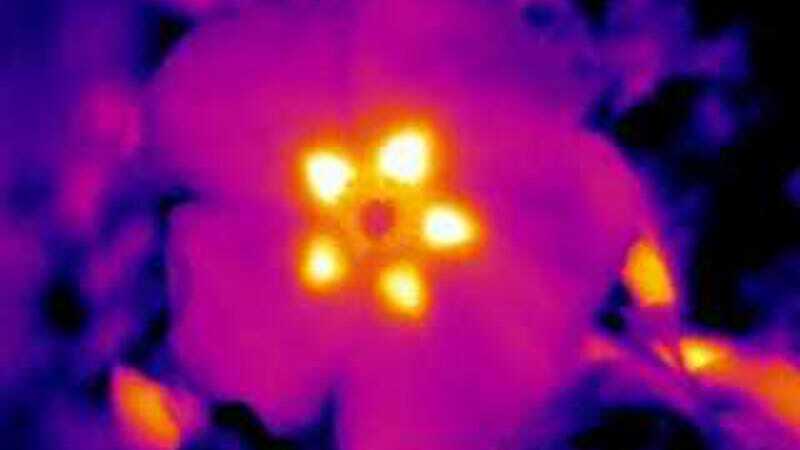 Using a thermal camera, the team took thermographs of flowers in three botanical gardens, including Royal Fort Gardens in Bristol. Complex temperature patterns were surprisingly common; of the 118 species studied, 55% exhibited intra-flower temperature differences greater than the two degrees Celsius difference that bees are able to detect. On average, the heat patterns were 4-5 degrees C warmer than the rest of the plant, and in some extreme cases as much as 11 degrees C warmer. To see if the bees were attracted to this added heat, Whitney’s team created artificial flowers that mimicked the observed heat patterns, but without the corresponding color patterns. In experiments with bumblebees—pollinators that rely on a wide assortment of flowers—the flying bugs detected and sought out the patterns. The diversity in patterns also allowed them to distinguish between different flowers, which they did preferentially (i.e. they exhibited favorites). This research shows that, along with cues such as color and scent, this “invisible” heat also serves to attract pollinating insects (at least bumblebees), helping them to locate a reward, typically nectar. As well as opening up a new field of research in understanding the interactions between plants and their pollinators, these findings are potentially important given current concerns about climate change. If pollinators are partly reliant on subtle differences in temperature across the surface of a petal, then even small changes in the temperature of the environment could have a large and unanticipated influence on how efficient bees and other pollinators are when they are visiting flowers with hidden heat patterns. We already know climate change is brutal. But it’s astounding how much of the natural world is being affected—and not for the better.